Quatre bisous! (four kisses) I nearly jumped as Dominique scolded me for stopping at two cheek kisses when it was customary (for her) to give and receive four. She is my French husband's dear sweet aunt, who in her own way was teaching me yet another French rule, or in this case an exception to what I thought was the norm of two cheek kisses upon greeting someone in France. Like following old culinary traditions and establishing good table manners, rules for donner une bise (or not) are a prominent part of France's social etiquette. Generally, women cheek kiss no matter what the relationship; men shake hands with acquaintances, reserving cheek kisses for relatives and close friends; and then depending on the region, the number of bises goes from one to a time stopping four! Even the French become confused about the magic number of regional bisous; Frenchmen take full advantage of this with pretty ladies by the way: "chez nous, c'est 4 bisous" (at home or where we're from, it's 4 kisses ;). But once that's known, you can count on waiting until everyone has given and received their proper share. 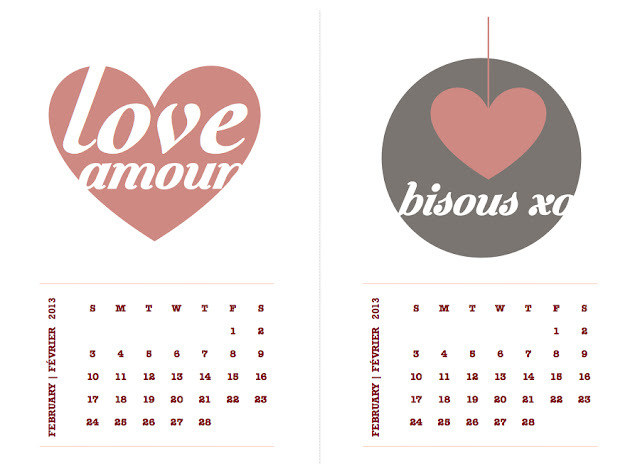 For the calendar, simply download (below), print and cut on the dotted line. I love the sweet simplicity of your design! And loved the story too - yes such French traditions are long-established and must be held, haha. Off to check the bisous map:) Enjoy your weekend!